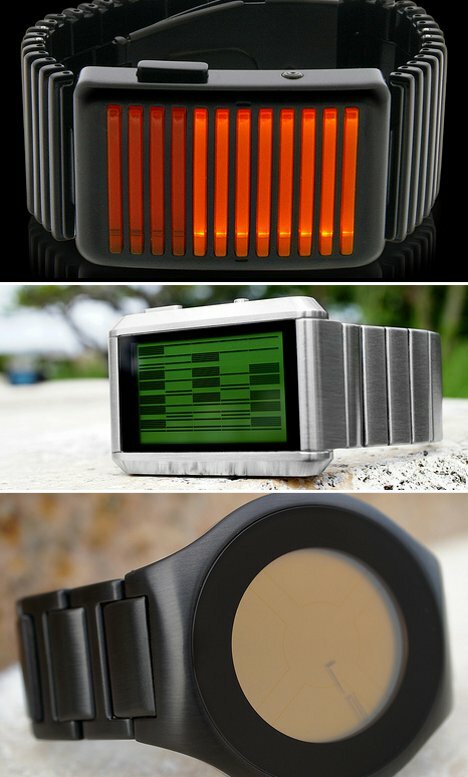 Gajitz readers know how much we admire the unique watch designs from TokyoFlash. Now, the timepiece gurus are giving you a chance to win a watch of your choice from their extensive product line. 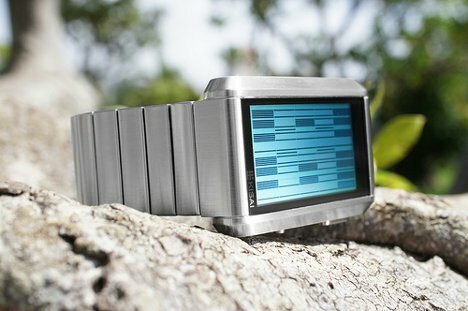 Just share this post on Twitter or Facebook to be entered to win a gorgeous TokyoFlash watch. After seeing the many – times – we’ve – featured – TokyoFlash – watches and concepts, the company sent us a few watches to peruse in person. We checked out the Kisai Denshoku, Kisai On Air, and Kisai Upload. We conducted some real-world tests, wearing the watches around for a few weeks and seeing how they worked, how they held up and (most importantly) how they looked. We tested out the Kisai Denshoku first because it was definitely the most unusual looking. The Kisai Denshoku doesn’t feature a traditional face; rather, it has twelve illuminating bars under a piece of acrylic. Press a button on the side and the bars start lighting up: first the hours, then groups of ten minutes, then single minutes. The functionality is pretty difficult to grasp at first, but after a while we got the hang of it. It’s a heavy, substantial piece that looks best on a bigger wrist – but also makes a fashionable statement on a small wrist. Next up was the Kisai On Air – one we had actually been eyeing on the TokyoFlash site for quite a while. 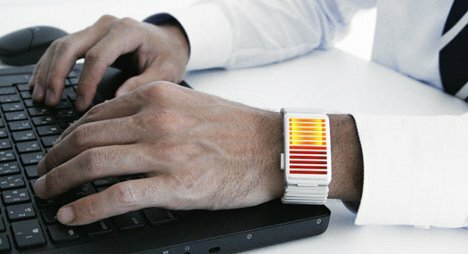 The gorgeous timepiece has a simple but powerful display that involves only one digital “hand.” The hand points to the current hour and is itself composed of the current minutes. 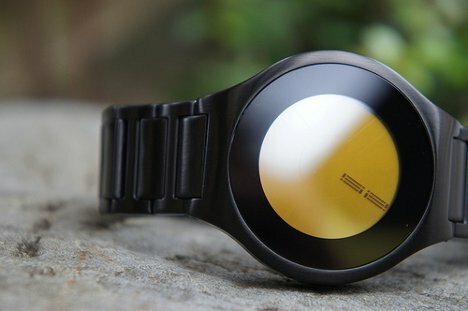 The watch was designed by a fan, voted into reality by the TokyoFlash community, and put into production based on its popularity. It includes a touch screen, date display, backlight, alarm, and an animation feature – and it is easily the coolest watch we’ve ever worn. The Kisai Upload is one of TokyoFlash’s newest releases. It is another design that has a non-traditional display, though it’s quite easy to decipher. The stretched-out numbers become clear when the watch is tilted to just the right angle – much like the classic optical illusion. The truly unique feature of the Upload, however, is its included 2GB of memory. The MicroSD card can be replaced by any capacity card you choose. Data transfer is simple and doesn’t involve removing the card – you just use the included USB cable. All of the watches we tested out were sturdy, substantial, well-made pieces. They’re surprisingly heavy and super stylish – and we can imagine them lasting for many years. 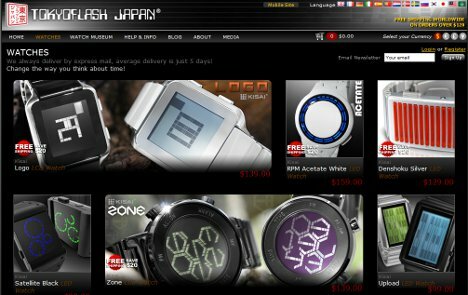 To win your own TokyoFlash watch, share this article on Twitter (including #Gajitz so we can find it) or on Facebook. A winner will be chosen randomly on October 13, 2012. See more in Clocks & Watches or under Gadgets. October, 2012.